Ishikawa Prefecture (石川県, Ishikawa-ken) is a prefecture in the Chūbu region of Japan on the island of Honshū. The capital is Kanazawa. 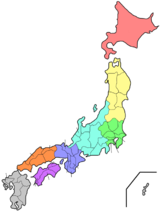 Ishikawa was formed merging Kaga Province and the smaller Noto Province. Ishikawa is on the Sea of Japan coast. Toyama Prefecture and Gifu Prefecture are on the eastern border of the prefecture. The southern border of Ishikawa meets Fukui Prefecture. The Noto Peninsula is in the northern part of the prefecture. The southern part is mostly of mountains. Kanazawa is in the coastal plain. The prefecture includes some islands in the Sea of Japan, including Notojima, Mitsukejima, Hegurajima. National Parks are established in about 13% of the total land area of the prefecture. ↑ Nussbaum, Louis-Frédéric. (2005). "Chūbu" in Japan Encyclopedia, p. 126. ↑ Nussbaum, "Kanazawa" at p. 467. This page was last changed on 31 August 2017, at 04:07.